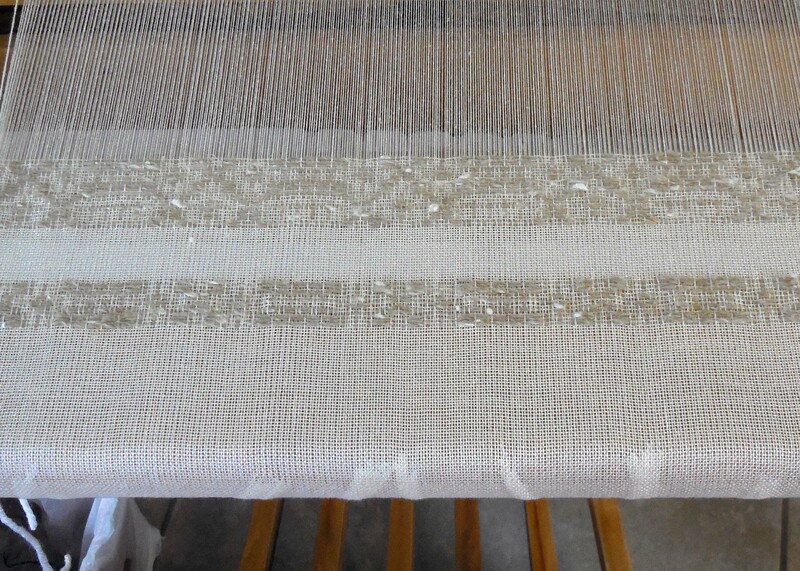 Overshot has a background of Plain Weave called Tabby. There are several “Must Have” books which beginning weavers, if they are serious about becoming good at the craft, will need to find. “New Key to Weaving,” by Mary E. Black, is one of those books. The first issue was published in 1949, followed by reprintings in the ‘40s, ‘50s and maybe even the ‘60s. My mother had one. My sister Ruth Dye, who ishttps://judithstclaire.wordpress.com/wp-admin/edit.php a master weaver, regularly consults her own well-worn copy. When I began to weave 1 1/2 years ago, I was instructed to find a copy. Period. After an intense search, I found a used copy that had a very moldy odor to it, and am really glad I have it. (The odor has since dissipated. To my great delight.) Mine is a 1957 issue. Hmm. I graduated from high school in 1957. Also, my father bought a 1957 Chevvy that year. I saw one like it sell recently at a rare car auction. The price nearly made me cry – but that’s a different story. The new book followed her first book, “Key to Weaving,” and extended Ms. Black’s teachings. She knows her topic and is an excellent teacher. 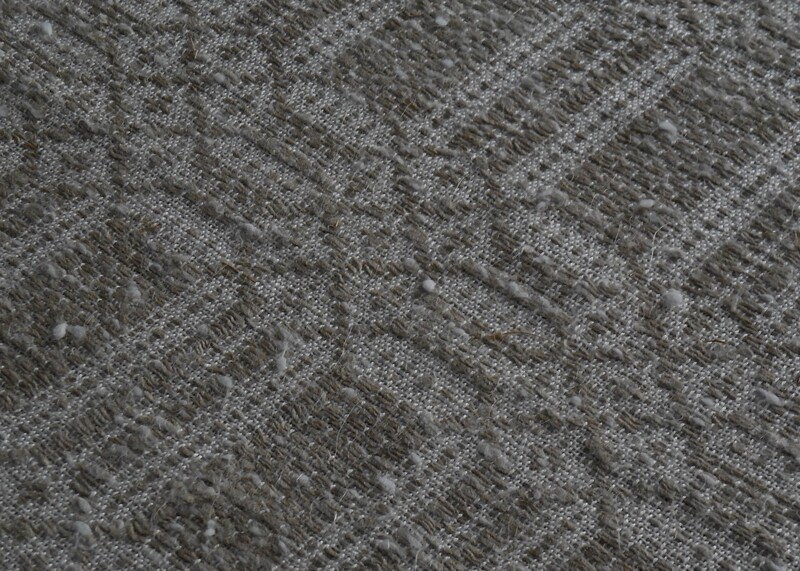 The overshot is a linen-cotton yarn with white cotton flakes. The publishing date on this weaver’s “bible” is notable. The lion’s share of weavers’ instruction manuals was written long ago. And as time passes, these books are becoming harder and harder to find. I guess that makes sense as weaving is a very old art slash craft. Well, thanks for sticking with me through the intro. The real reason I’m writing this is to give you an insight into Ms Black’s writings and thinking. So, here goes . 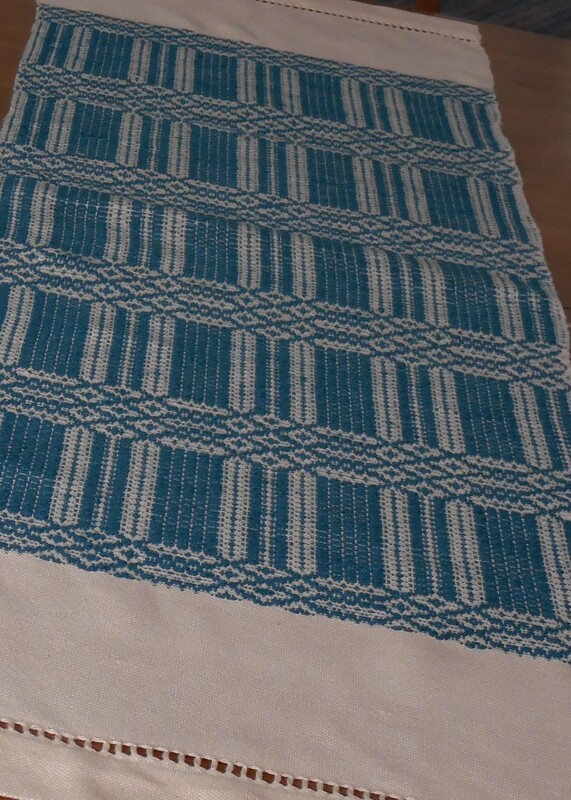 . .
A finished cotton overshot table runner. One of my first woven pieces was the overshot pictured here. Also, one of my sister’s first pieces was overshot. Mother’s weaving activities were not long-lived, but I cannot remember her producing one overshot piece. Woops, I can recall one where she used overshot trim on a table topper. © 2014 Judith St.Claire. All rights reserved.